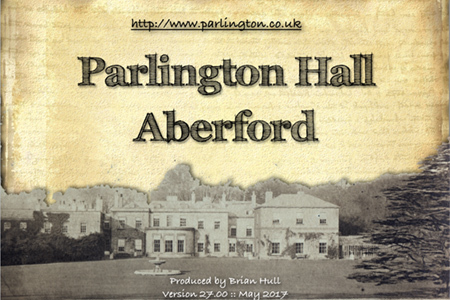 1) "A detective story; the re-discovery Parlington Hall" The history of the Hall, Aberford, Yorkshire, including scarce pictures and analysis of the mansion's demise. Extensive information on the topic can be found on the website, including many pictures of the locality. 2) The Gascoignes of Parlington. 3) Aberford Railway, a private line built to transport coal from Garforth to Aberford. 4) Self publishing! You can do your own website with very little computer knowledge! Methods for doing so. A talk about getting your own website. 5) 'War Games in Parlington', The Gascoignes' and the Military from 1797 to Present Day! Yes? sham fights in the late nineteenth century, with opposing forces battling it out for the possession of Parlington! 6) Lord Armstrong, Cragside and the Great Armamant Works at Elswick. 7) The Trials and Tribulations of House Refurbishment, by example!